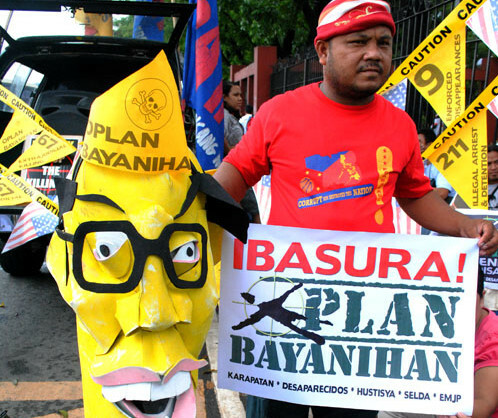 Global alliance of overseas Filipinos Migrante International condemned the Aquino administration’s coordinated and intensified attacks against political activists and mass organizations. “We condemn in strongest terms the harassment, repression and orchestrated attacks on the rights and civil liberties of political activists and mass organizations. We believe that the recent spate of harassments, warrantless arrests, filing of trumped-up charges, baseless red-baiting and surveillance being conducted by the Armed Forces of the Philippines (AFP) and other state agents are all part of a coordinated attack on the democratic mass movement. There is an undeclared martial law happening and it is being perpetrated by the state,” said Sol Pillas, Migrante International secretary-general. Pillas said that since April, there had been numerous cases of harassments being done by the military on political activists and activist leaders. Mass organizations and unions like COURAGE, BAYAN, KMU, KMP, Kabataan Partylist, Anakpawis, Anakbayan, ACT Teachers, Gabriela, KARAPATAN and Migrante nationwide have also reported different cases of harassment and surveillance in the last months. The attacks have been especially brazen these past few weeks that union leaders and activists have filed for a writ of amparo and habeas data at the Supreme Court last July 14. Leaders of mass organizations are also set hold a dialogue with the Commission on Human Rights tomorrow, July 23. Justice for Jerwin Roj Royupa! #SONA2018: OFWs and families call for an end to Duterte’s plunder and tyranny! Punish Juraj Hossu! Justice for Henry Acorda! Justice for all OFW victims of racism and hate crimes!